This actually came up in the comments section in my earlier post about choosing a bat, and I thought it http://www.zupec.com/Softball08/Nationals/ZUP_1134-cr.jpgwas interesting enough that it should be a post on its own. Thanks to Mike Hanscom for bringing it up. Most of us have experienced that situation where a hitter is using a bat that's too big for her. Young hitters will often grab the biggest bat they kind find instead of the biggest bat they can actually handle. I've seen 10U players try to swing bats that were almost as big as they are. Swinging a bat that's too big will cause a slow swing, and lots of mechanical difficulties. But what about going the other way? Instead of swinging a bat that's too big, is it bad to swing a bat that's too small? Certainly some people preach that when the pitching gets faster you should go from your normal bat to one that is shorter and lighter. I disagree. I think swinging a bat that's too small can cause almost as many difficulties as one that's too big. They're just different difficulties. I can definitely talk to the problems with a small bat. I am a big guy, and though I don't work out much anymore (unfortunately) I retain a fair amount of natural strength. I also grew up swinging a wood bat. When it's time to hit fungos in our clinics, I will sometimes grab one of the team bats we have lying around. If it's a 32 inch/22 ounce bat, I have to admit it's a bit difficult for me to use. Even worse is when I try to hit off a pitching machine with it. I find it difficult to control because there just isn't enough mass per the effort I'm putting in. I will tend to over-swing. I would think the same would go for any hitter using a bat that's too small. The other problem with a bat that's too short, of course, that it forces the hitter to stand closer to the plate in order to get full coverage. 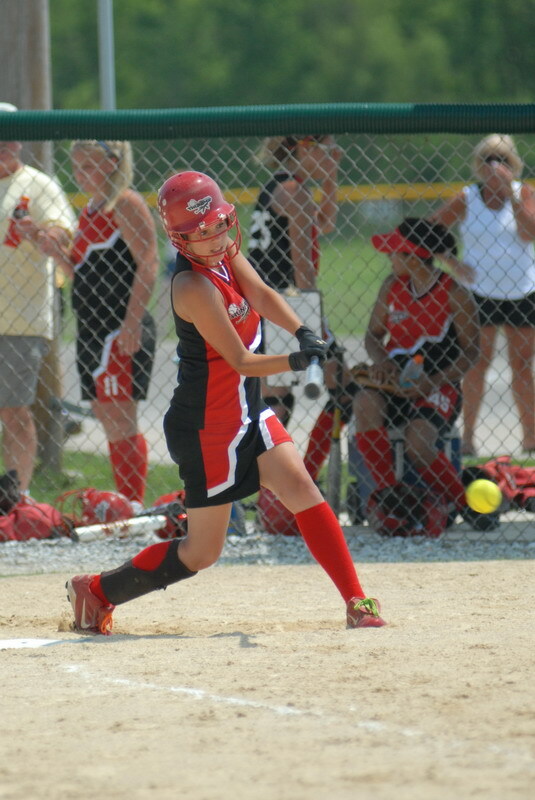 With a properly sized bat, she can move off a little bit, which makes it a little easier to fend off the inside pitch. Again, the ideal bat is one that comes to the hitter's wrist when she's standing straight up. The proper drop depends on her strength, but except for the very young (9 or younger) it shouldn't be more than a -10. Using the right size bat will help her take better advantage of all the other things you're working on.